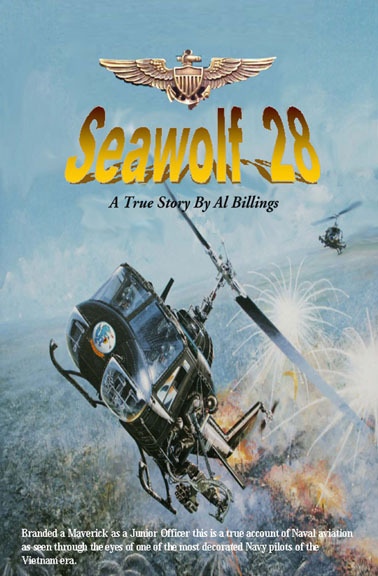 Seawolf 28 is an exciting action filled story about one of the most decorated naval aviators of the Vietnam era. It brings the reader a dramatic account of a twenty-two year career of a Navy helicopter pilot. By the end of the Vietnam War “Hollywood Al” was a four tour veteran with well over 600 missions and the recipient of over forty medals and citations, including the Silver Star and Distinguished Flying Cross. The story spans the gamut from a young cadet full of exuberance and high ideals, nine engine failures, dozens of life threatening in flight incidents and hair raising combat stories to standing up for what was right at all costs. Throughout his flying career Hollywood Al qualified in over 20 different aircraft and rose from the enlisted ranks to squadron Commanding Officer of the oldest combat rescue squadron in the Navy. Seawolf 28 is a timeless, powerful, honest and uncompromising first hand account of a true Maverick that knew no limits when it came to standing up for his men and what he believed in. What makes this story stand out is the candid and frank portrayal of naval aviation, politics and the true character of individuals under the most stressful of times.